In the city of Armyansk, in the north of the annexed Crimea, at night between August 23 and 24 a release of unknown substance occurred. Later it became known that the substance in question is sulfurous anhydride that was released in the air as the work at the “Crimean Titanium” plant was disrupted. The contamination from the occupied Crimea is also spreading to mainland Ukraine, to Kherson region in particular. UCMC takes a look at what the reasons of the disaster are and how threatening the consequences may become, read on. What happened? On August 24 locals noticed colored fog above Armyansk, while the next morning everything was covered with oily rusty slick. Leaves started falling from the trees. People started publishing on the social media the photos of damaged crops in their backyards – those of raspberry, strawberry, pepper etc. The cases of animals that died falling victims to the contamination were also reported. Later the occupational authorities recognized that the reason for the contamination was the drying of the acid reservoir located near the local giant chemical producer – the “Crimean Titanium” (Krymskyi Tytan) plant. The plant is one of the biggest producers of titanium dioxide in Eastern Europe that is used in the lacquer and paint industry, production of plastic, rubber, resin etc. The plant is part of the assets of Dmytro Firtash, one of the few Ukrainian businessmen whose possessions in Crimea have not been “nationalized” by the occupational authorities. After the annexation of Crimea in 2014 the PJSC “Krymskyi Tytan” was transferred for management to the Moscow-based LLC “Titanovye Investitsii” (Titanium Investment). Resulting from the drying up the reservoir is intensely releasing sulfurous anhydride in the air – the evaporation of the titanium dioxide and sulfur acid production waste. Sulfurous anhydride released into the air causes irritation and affects respiratory organs. When combined with water (with precipitation in particular) it produces sulfur acid. That’s why acid rains are possible on the peninsula in the nearest time. 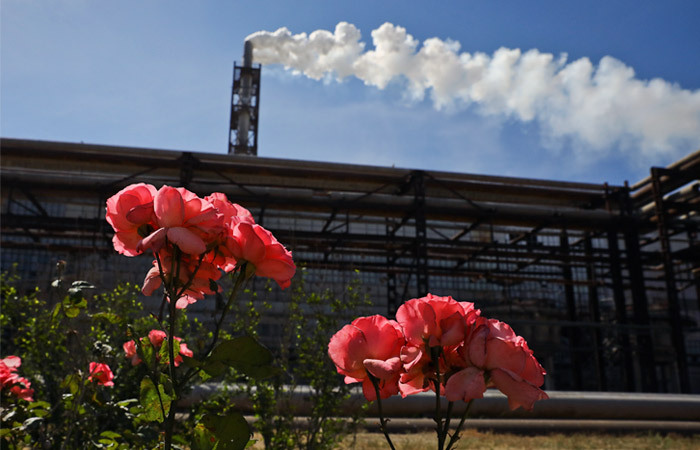 Why has the reservoir of the “Crimean Titanium” plant dried up? Until 2014 the reservoir was fed by waters of the Northern Crimean Channel constructed in the Soviet times after the then Crimean region was included into the Ukrainian Soviet Republic in 1954. Before Russia illegally annexed Crimea in 2014 this 400-kilometer artery was supplying water from the Dnipro river to Crimea, covering over 80 per cent of the fresh water demand on the peninsula. After the Russian annexation of Ukrainian Crimea the supply of water from Dnipro to the peninsula was stopped. The reasons for that were both economic and political. After the annexation of Crimea by Russia local de-facto authorities neither signed a respective deal, nor repaid the debts for pumping of the water (about UAH 1,5 million, equivalent to approx. USD 53 thousand). Ceasing water supply was also another instrument to exercise pressure upon the occupant. In May 2014 Ukraine constructed a temporary dam, since 2015 it has been constructing a permanent one. 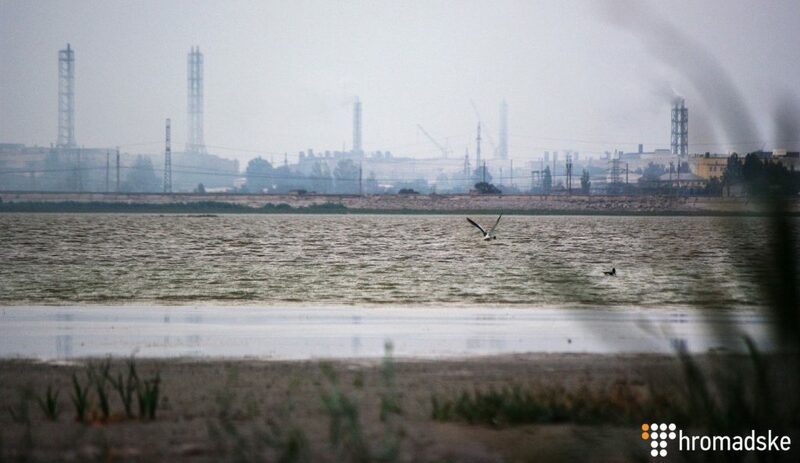 Since when the water channel was cut, the amount of water in the reservoir at the “Crimean Titanium” plant decreased from 30 million cubic meters to less than two. Controversial reaction of Crimea’s occupational authorities. Despite of the fact that the first signs of the contamination were discovered on August 23-24, Russian media released the information on the incident only on August 27. Moreover in their first reports the occupational authorities denied the harmful nature of the emissions reassuring that there is no threat to the health of the people. On August 31 Interfax quoting Sergey Aksyonov, the “Prime Minister” of Crimea, said that the “Crimean Titanium” will not be stopped while water is being poured into the acid reservoir as an emergency measure. On the same night the streets of Armyansk were sprayed with the sodium solution. On September 1 the first day of school ceremonies were not cancelled but shortened instead. Evacuation of children. On September 4 the address of the self-proclaimed head of Crimea Sergey Aksyonov was released. He admitted that on “the night before” (when the emissions had already been on for over 10 days), the share of harmful substances in the air exceeded the established maximum. Evacuation of school- and preschool-age children started in Armyansk. According to the Crimean “Healthcare Ministry”, they are about four thousand persons. Will ceasing the plant’s operation resolve the problem? On September 4 the news coming from Crimea reported that the plant was stopped. As of September 4 three out of the eight furnaces at the “Crimean Titanium” were stopped. It will take several more days to stop the production completely. At the same time ceasing the plant’s operation will not resolve the issue of toxic emissions as what needs to be done first of all is to pour water into the reservoir. However there is not enough water in Crimea to do that now. “The process of filling it with water will start in one and a half – two months, a pipe needs to be installed,” Aksyonov said when visiting Armyansk on September 4. Where this pipe needs to start from, the Crimean de-facto authorities do not know yet. As an option they are considering the Karkinit Bay. Laboratory tests are required to say whether diluting the acid with the sea water will not make the situation worse. The tests are to be completed within three days. According to the Crimean “Emergency Ministry” as of September 6, 52 cubic meters of water are being poured into the reservoir daily. But it is not enough as what’s needed is several million cubic meters of water. If the water is pumped from wells in big volumes it may become salty. Ukraine’s reaction. Ukraine’s Parliamentary Commissioner for Human Rights Lyudmyla Denysova sent a note to inform Erik Solheim, Head of UN Environment, and the director of the UN Environment Programme Regional Office for Europe Jan Dusik, of the situation in Armyansk. On September 5 a working group set to determine the ecological situation started its work in the districts adjacent to the Northern Crimea. The Kherson directorate of Ukraine’s State Emergency Service reported that expert conclusions from the lab are to come in the nearest time. The control point between the mainland Ukraine and Crimea closed. 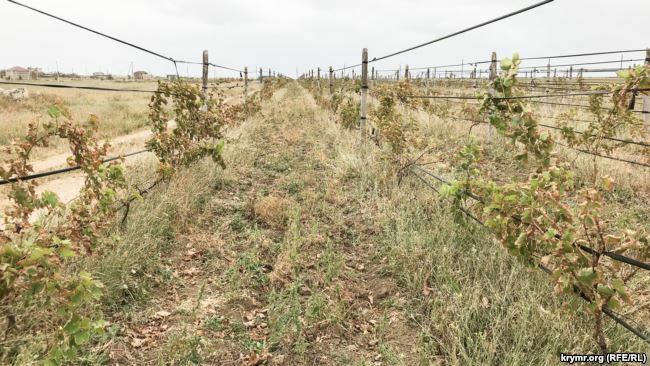 On September 7 it became known that two control points – Kalanchak and Chaplynka at the administrative border with the annexed Crimea had temporarily stopped working due to the chemical emissions at the “Crimean Titanium” plant. The measure was introduced to save lives and preserve the health of the State Border Guard Service personnel as well as of the citizens living close to the administrative border and of those who cross the above control points. It is now possible to cross the administrative border with the annexed Crimea only through the Chonhar control point that continues working as usual. 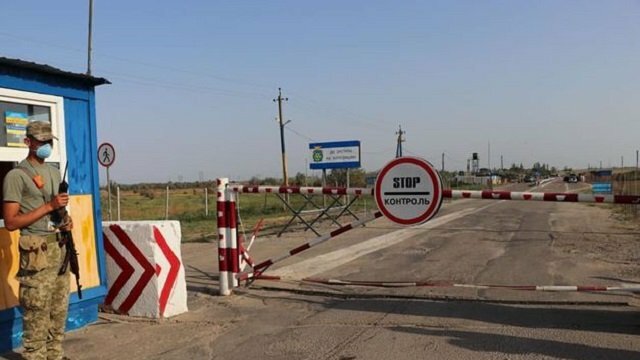 At the same time Ukrainian citizens from the occupied peninsula headed to mainland Ukraine in try to escape the contamination will be checked according to the simplified procedure, the border guards reassure. Border guards will stay in service at the temporarily closed control points but will be letting people through only in case of emergency. Reaction of Ukraine’s President. The President of Ukraine Petro Poroshenko called the situation with the emissions an environmental disaster as well as ordered to have the children from Armyansk sent for health treatment to Kherson region. “I would ask that we prepare the necessary conditions to invite the children from Armyansk to Kherson region so that they can have a rest and improve their health, so that we can save Ukrainian children affected by the ecological attack. 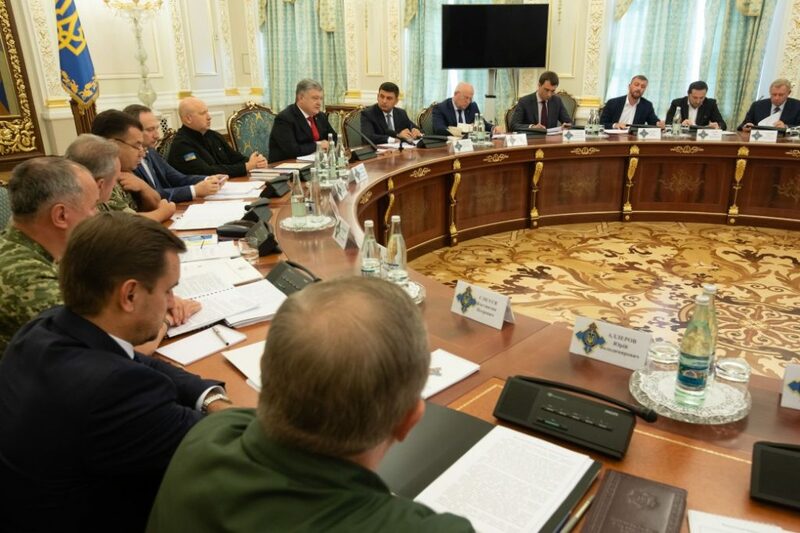 I ask to task our regional administrations so that they arrange for respective invitations,” Poroshenko said at the meeting of the National Security and Defense Council. The President also emphasized the need to create at international commission “to stop the environmental disaster that is affecting Ukraine”.